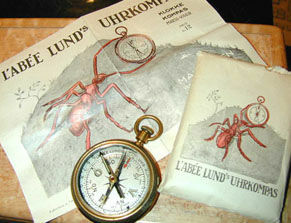 This is an extremely rare antique compass made by L'Abée Lund. Johan Henrik L'Abée-Lund was a Norwegian engineer. He manufactured these compasses from approx. 1922 to the late 30's. The name Uhr-Kompass means "watch compass", and was meant quite literally: It could be used as a sundial, with the use of the table on the backside. The red little ant was a part of a promotion gimmick. In these days every product should have a marketing slogan, and for this compass it was "Kjøp kompassen med Mauren i syd" i.e. "Buy the compass with the ant pointing south", referring to the well known fact that in the woods you can find approximately South by looking at what side of the trees the ants build their hill" (Extract from the Compass Museum). 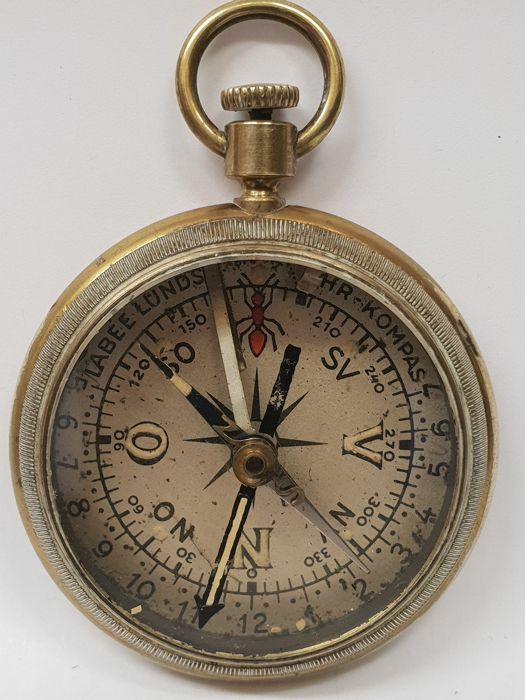 The compass has a brass case in very good condition without any dings or dents. It was left with its original patina gained over the years. It has a table engraved on the back that allows reading time when the compass is used as a sundial. It has a thick glass crystal still in excellent condition without any damage. It has also a rotating bezel. You have to push the release button to release the compass needle, which finds North easily and precisely. When the push button is released it locks the needle again. This is a very ingenious and unusual transit lock on open face compasses. Usually, on these compasses the transit lock must be operated manually. So if forgotten, the needle may remain unlocked when the compass is carried. On this model, the transit lock is activated by default and you have to de-activate it in order to use the compass and once it is released it becomes operational again automatically. The compass measures 52mm in diameter and only 11mm thick (very thin). This is a fine example of a renown maker that is very hard to find. Swift delivery and goods arrived in perfect order.